This is the sixth post in the GeoGebra 4.0 Sneak Peek Series. 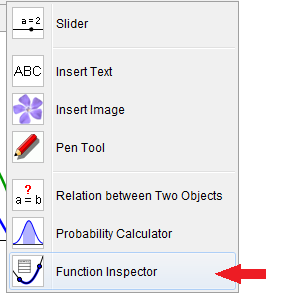 In this post, we are going to learn about the Function Inspector tool. 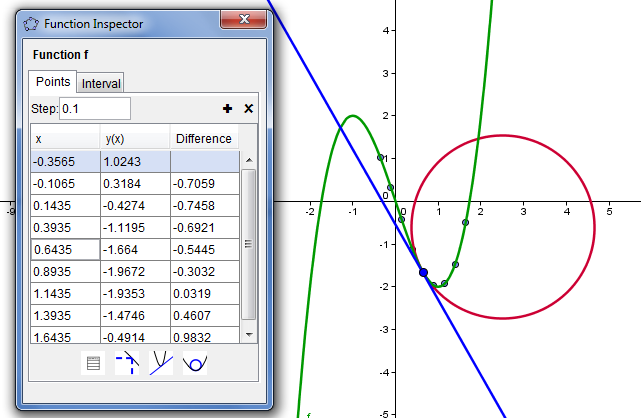 The Function Inspector is a new tool introduced in GeoGebra 4.0. This tool ‘inspects’ functions revealing properties such as its minima, maxima, root, area, and mean, etc., of a given interval. GeoGebra 4.0 will be released by the end of August 2011. In preparation for the release of the software, I have created a series called GeoGebra 4.0 Sneak Peek Series. The series is an overview of the new features of GeoGebra. The topics that have been discussed are listed below. I will post one topic each week, so you may want to keep posted by following this blog/page. You can follow Math and Multimedia using Twitter, RSS Feeds, Email subscription (see email box at the right), or by Liking it on Facebook.